Green People Purify and Hydrate Organic Cream Cleanser is an anti-ageing skin purifying cleanser which provides intense skin hydration. It is an extra-gentle and light cream cleanser, lifting away make-up and impurities, leaving your complexion clean, smooth and hydrated. Aqua (Spring Water), Helianthus Annuus (Sunflower) Seed Oil*, Glycerin* (Vegetable Derived), Squalane (From Olives), Cetyl Alcohol, Cetearyl Alcohol (Emulsifying Plant Wax), Cetearyl Glucoside (Plant Derived Emulsifier), Glyceryl Stearate (Plant Derived Emulsifier), Butyrospermum Parkii (Shea) Butter*^, Rosa Moschata (Rosehip) Seed Oil*, Vaccinium Macrocarpon (Cranberry) Seed Oil*, Punica Granatum (Pomegranate) Seed Oil*, Aloe Barbadensis (Aloe Vera) Leaf Juice Powder*, Hibiscus Sabdariffa (Hibiscus) Flower Extract*, Rosmarinus Officinalis (Rosemary) Leaf Extract*, Ananas Sativus (Pineapple) Fruit Extract, Hydrolysed Jojoba Esters (From Jojoba Oil), Aroma [Citrus Nobilis (Mandarin) Peel Oil*, Citrus Limon (Lemon) Peel Oil*, Cinnamomum Camphora (Ho Wood) Bark Oil, Zingiber Officinalis (Ginger) Root Oil*^, Lavandula Angustifolia (Lavender) Herb Oil*^, Cananga Odorata (Ylang Ylang) Flower Oil*^], Sodium Stearoyl Glutamate (Plant Derived Emulsifier), Benzyl Alcohol, Salicylic Acid, Sorbic Acid, Limonene*, Benzyl Salicylate*, Benzyl Benzoate*, Geraniol*, Farnesol*, Linalool*, Citral*. 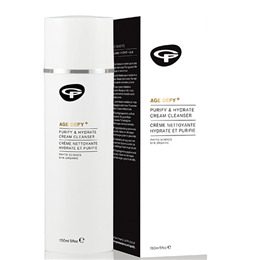 Using your fingertips, apply Purify and Hydrate Cream Cleanser in small circular movements to face and neck. Remove with cotton wool or wash off with warm water and follow with a splash of cold to stimulate circulation. Below are reviews of Green People Purify and Hydrate Cream Cleanser - 150ml by bodykind customers. If you have tried this product we'd love to hear what you think so please leave a review. Have been using this product twice a day for the past year. I find it cleans the skin and removes my makeup easily. Knowing that there is no harsh ingredients to wreck my skins texture is a bonus and leaves my skin soft and silky. I always struggled with rashes from other cleansers but this is so pure but gutsy that i have stuck with this. Very happy with product.